English Name: Burnet rose, Scotch rose Botanical Name (Latin): Rosa pimpinellifolia (R. spinosissima) Irish Name: Briúlán Order: DICOTYLEDONES Family: ROSACEAE Brief Description: Very spiny, deciduous shrub, usually c. 0.5m tall; flowers solitary, white, cream or pink; hip black with persistent crown of sepals. 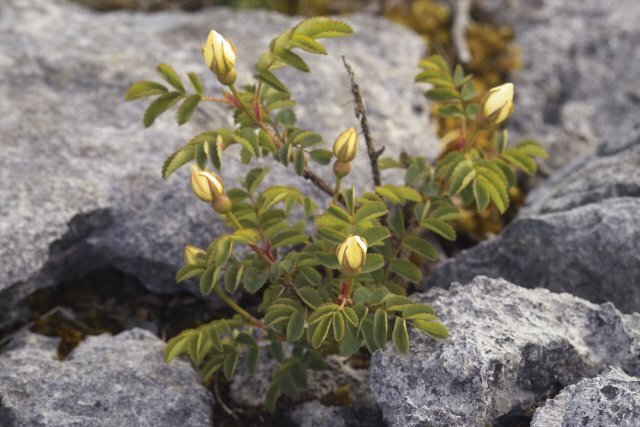 Although the land surface and vegetation of Ireland has been greatly changed by human activity, the underlying rock and soil still has great influence on the island's flora and fauna. Most of the centre of Ireland, for example, and most valley floors in the south of the island, are layered with limestone, made up of fossil shells and marine organisms laid down under the ocean of the ancient Carboniferous Age, 370 million years ago. In other countries, this layer remains buried under subsequent sedimentary strata - of chalk or shale, for example. 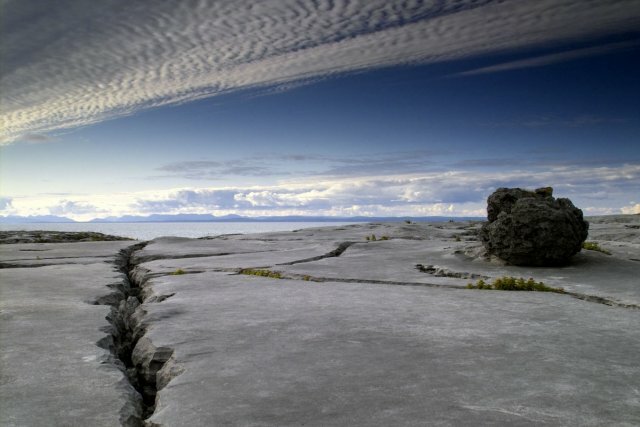 But the weathering of Ireland by rain and wind was so severe that much of the island was eroded down to the limestone. The rock-grinding Ice Age glaciers left the lowland bedrock covered with boulders and gravel - sometimes in moulded ridges and hillocks we call (from Irish words) eskers and drumlins. But in some upland regions, further erosion has bared the limestone itself, so that in the hills of the Burren, for example, brightly coloured land- snails build their shells directly from the calcium of their ancient marine ancestors. Lime-rich soil favours lime-loving wildflowers, such as cowslips and burnet rose, and its grasses build strong bones in cattle. Acid soil has its own range of plants, such as heathers and rhododendron. At the rim of Ireland, some of Europe's most ancient metamorphic rocks (changed by pressure and heat) were lifted up by tectonic action, along with volcanic granites, and here most soils are acid. In all peatland, even that of raised bogs above limestone, acid conditions are created by a different kind of chemistry involving mosses and rainwater. In our lakes, too, the chemistry of the water makes a big difference to wildlife. In the lime-rich lakes of the lowlands, freshwater crayfish have plenty of calcium for their shells and native trout grow to specimens prized by anglers. In the small, acid lakes of the uplands, with few nutrients and water-plants, trout stay small and lean.